The climate of Jinan is continental, with cold, dry winters and hot, humid summers. The city is located in north-central China, at 36 degrees north latitude, and 180 kilometers (110 miles) away from the sea: the position in a plain and the distance from the sea make the summer heat intense and unpleasant, while in winter, cold air can stagnate on the ground. 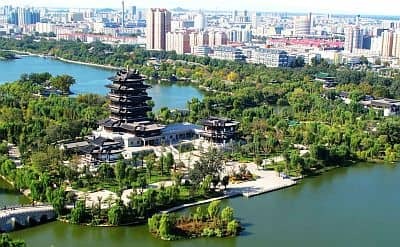 The capital of the province of Shandong, Jinan is also one of the ancient Chinese capitals; today it is a metropolis of millions of inhabitants, polluted as often happens in large Chinese cities. Precipitation amounts to about 670 millimeters (26 inches) per year; owing to the monsoon regime, the rainiest season is summer, while the driest is winter. Here is the average precipitation. Winter, from December to February, is cold and dry: the average January temperature is 0 degrees Celsius (32 °F), but sunny days are quite frequent. Precipitation is rare and not abundant, however, given the low temperatures, there may be some snowfalls, generally light. The north wind can bring cold waves, with minimum temperatures around -15 °C (5 °F), as well as the dust of the Gobi Desert. On other occasions, especially in December and February, there may be quite mild periods, with maximum temperatures around 10/12 °C (50/54 °F). In spring, from March to May, the temperature increases, while rainy days become gradually more frequent. In March and April, the clash between air masses can cause sand storms. In May, there may already be very hot days, especially at the end of the month. Summer, from June to August, is hot and muggy; owing to the Asian monsoon, it is the rainiest season (actually, it is the only really rainy season). June is already a hot month, but rainfall and muggy heat generally start in July, or during the month of June. However, the rains display an erratic pattern from year to year. The amount of sunshine is fairly good, but considering the length of the days, it is slightly lower than in the other seasons. The rains occur mainly in the form of downpours or thunderstorms. Periods of good weather during summer can be very hot, with highs around 38 °C (100 °F), and in these cases, the heat does not give relief even at night. Usually, August is not as hot as June and July, but it is more sultry. Autumn, from September to November, is initially warm, and gradually becomes milder, and then quite cold by November, but it can sometimes get cold at night already in October. The rains decrease and become rare enough. The amount of sunshine in Jinan is good all year round, though, as mentioned, it decreases slightly in summer because of the monsoon. Here are the average sunshine hours per day. 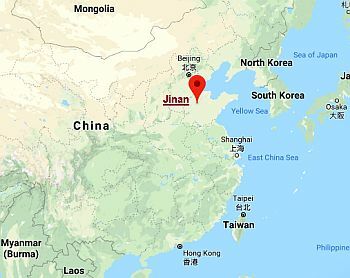 From July to early October (and occasionally also in the second half of June), Jinan can be affected by typhoons, the tropical cyclones of South-East Asia, although this area of China is less exposed than the south. South of Jinan, and just north of the city of Tai'an, we find Mount Tai (Tai Shan), a UNESCO World Heritage Site, and one of the five sacred mountains of Taoism. The mountain rises directly from the plain; the top (called Jade Emperor), at 1,545 meters (5,069 ft) above sea level, offers a beautiful view of the city. Here, the winter is freezing, although dry (but sometimes it can snow), while the summer is cool, but even more rainy than the plains. Precipitation amounts to 1,100 mm (43 in) per year, of which 700 mm (27.5 in) fall from June to August. Here are the average temperatures. The best times to visit Jinan are spring and autumn, ie from the end of March to mid-May and from mid-September to the end of October. In April and October, at night, it can sometimes be cold, with lows around freezing.